Do you have an Instagram account for your travel website or blog? Chances are you do, but are you marketing your travel website or blog with Instagram? If all you are currently doing on Instagram is posting a photo every few days, you'll be missing out on the true potential of the platform. Just like Twitter, Facebook and Pinterest, you don't want your competition taking your readers because they have a profile and you don't. According to Statista, as of September 2016, Facebook was the first social network to surpass 1 billion registered accounts and currently sits at 1.71 billion monthly active users. The eighth-ranked photo-sharing app, Instagram had over 500 million monthly active accounts. This is 5x more active users than Linkedin, which currently has 106 million users. If you haven't started an account, or you're not actively using Instagram, now is the time to get started! Before you take on the visual world of Instagram, make sure you learn about the social network, what it does and how to make it work the best way for your travel brand. Because Instagram is primarily a mobile app, you'll have to download it to your mobile device before you can sign up for an account. Instagram is free in both the Apple App Store and the Google Play store. Once you've downloaded the app, you'll be prompted to either log in or sign up. To sign up, you have two options: You can either connect your Instagram account to Facebook, or you can enter your email if you don't have a Facebook account or prefer to keep your accounts separate. If you sign up with Facebook, your information will be filled in for you, including your name and profile picture, but you'll still be prompted to create a username and password. If you choose to sign up with your email, you will be prompted to enter a username and password, along with your full name and phone number (both of which are optional). Once you've entered your information, you can select to connect your Instagram to Facebook by choosing "Find Facebook friends to follow," or you can find people to follow based on your phone's contacts. You can also skip both of these options if you'd prefer to set up your account before following others. Once your account is created, you can go to the Profile tab via the button on the bottom right of your screen to add more information to your profile (and, eventually, to see your own posts). Tap the Edit Your Profile button to change your name, username and profile picture, or to add a website and a short biography (up to 150 characters, so just slightly longer than a tweet), support options, clear your search history and log out. I used vertical spacing and emojis. This is a bio formatting technique to help make it look more interesting that it would if it were just one boring sentence about my blog and services. I’m not saying you absolutely need to use emojis or vertical formatting. Think about your target audience and what they might like to see in your bio, and take a look at what you most successful competitors are doing. From there, you can make an informed decision about how to format your bio. Tip: While it’s good to be creative in your bio, you shouldn’t sacrifice clarity for the sake of creativity. Make sure your bio states what your company does in a way that allows the people who view your profile to immediately understand it. Navigating the Instagram app is fairly simple. Across the bottom of the app, you'll see five buttons that will take you to where you need to go. From left to right, you'll see the Home tab, a Search tab, a camera button (which is where you'll go to create a new post), an Activity tab and your Profile tab. When you open the app, you'll automatically be taken to the home page. This is where you'll see an endlessly scrolling stream of the most recent posts from all of the users you follow, along with your own posts, if you've added any. There are many ways to interact with other users on Instagram. Options include everything from the ability to tag other users in your photos, to the ability to privately message people. Tagging: Just like you can tag other users in your photos on Facebook, Instagram allows you to add tags before you post an image or video. To do so, tap the Tag People option before sharing your photo, and then tap in the photo where you'd like to add a tag. The app will then prompt you to type in the person's name to search for him or her. Once you've tagged other users in your photo and shared the image, other users can tap on the photo to see the people who are tagged. Mentioning: Mentions on Instagram work very similarly to Twitter, in that you use the @ symbol to tag other users in your comments or photo or video captions. Typing in the @ symbol, followed by the first letter of a person's username, will bring up a list of people you can select from; or, you can simply finish typing out the person's username on your own. It's also important to note that if you want to reply to another user's comment (even on your own photos), you need to tag the person in it with an @mention, or that user won't get a notification (unless it's a photo in their feed). Liking: Liking is a simple way to connect with other users. To like a photo, either double-tap the image or tap the heart button under the post. To view photos you've liked, go to your profile, press the gear button on the top-right corner and select Posts You've Liked. Commenting: Another simple way to connect with other users is to comment on photos. Next to the Like button is a Comment button — just tap it, and the app will take you to the Comments page for that photo, with a text box where you can enter in what you want to say and hit Send when it's complete. Direct messaging: Users can communicate privately via a feature called Instagram Direct. To access it, go to the app's home page and tap the button on the top right corner. Here, you can send instant messages, photos and videos to other users. To send a new direct message (DM), tap the "+" button on the top right corner. This will pull up two options at the bottom of your screen: Send Photo or Video, and Send Message. If you choose Send Photo or Video, you can either take a photo/video or upload one from your camera roll, edit it just as you would any other post, add filters, write a caption, and then choose a user (or multiple users) to send it to. If you choose Send Message, Instagram will prompt you to select a suggested user or to type in the user you would like to DM. Once you've selected your user or users, simply hit Next and you'll be taken to a chat screen where you can send your message. Once you've sent the message, you and the recipients can message back and forth. Users who are not already following you will be asked whether they want to allow you to send them photos and videos before they can view your direct message. Finding your ideal readers and/or customers on Instagram is fairly easy. The first thing you should do is find five -10 similar websites or travel niche's to yours, who are also on Instagram. Look at the accounts who they are following. Also, think about not only checking out who is following them, but also to follow similar accounts. These people are more likely to also be interested in your travel website. For example, if you’re website focuses on luxury travel, you’d want to follow some of the people who follow other luxury travel brands. If you’re a travel agent, you’d want to follow some of the people who follow other agents with a similar niche. The above is a great way to start gaining new followers and brand awareness. Let's be clear, not all of the people you follow will follow you back. But some of them will, and there’s a good chance they’ll engage with you if you’re posting the quality content. Next, you can start interacting with those people by commenting on their photos, liking their photos, and even sending them direct messages that are brand specific (NO SPAM). You know your ideal customer, but do you know what kind of content will encourage them engage with your brand on Instagram? If not, it’s time to start researching. Take a look at your competitors’ accounts, and figure out which of their photos get the most engagement. Based on their popular photos as create photos of your own that are inspired by these popular posts. Show off your travel tips. Go behind the scenes. Take pictures and videos to show you traveling, especially if the process is unique or interesting, or something your readers ask about often. Ask your readers to show off their photos. Ask your readers to use your custom hashtag with their travel photos and to tag you. You can then re-post (re-gram) their photo to your feed or post and tag them with the photo credit. Post exclusive deals on Instagram. Give back to your Instagram followers by offering them discounts, giveaways and more just for following you. Inspirational quotes. A lot of Instagram accounts have had great luck using this tactic as their posting method. Others add a quote post every few days. Test it to see if your engagement improves with this type of post. Blog post images. If you are posting regularly on your blog, this is a great way to promote the content and drive people to your website from Instagram. Product sneak peeks. What a great way to get feedback on new travel product reviews! Try several (or all) of these, and see what gets the most engagement. Then, you can change your posting strategy based on what your audience likes best. Use natural light to your advantage. If you’re shooting outdoors, try to take the photos in the late afternoon when the lighting is best. If you’re indoors, just open up a window (or your blinds) and you’ll be good to go! Edit your photos. Instagram itself has some great editing options. The default filters included in the Instagram app aren't the best choice! Instead, download a photo editing app like photoshop and make a few adjustments until your photo looks great. If you’ve got an iPhone and would like to learn how to use it to take amazing photos, check out the iPhone photography school blog. It’s full of tips that’ll help you boost the quality of your photos! A #hashtag is a clickable link. When you use hashtags in your posts you and anyone else are able to tap the hashtag to see a page that shows all photos and videos people have uploaded with that hashtag. When you’re using hashtags, think about what words your target market might be searching for that also apply to your photo. If you’re running an entrepreneurship blog and posting inspirational quotes to your Instagram account, you might try using hashtags like #entrepreneur and #mondaymotivation. Whatever industry you’re in, use the Hashtagify tool to research and determine the best hashtags to use for your business and target audience. When you type in a tag, you’ll get other tag suggestions. Hashtags are a great way to help other users find your content on Instagram. Since users can both search for hashtags and click on hashtags they see in posts on the app, using relevant hashtags can be a highly effective tool for getting noticed. Just like on Twitter, you have to make sure you're using the right hashtags for your brand. Using popular hashtags just because they're popular might annoy your current and potential new followers, and it will be obvious you're just trying to get more followers and exposure. Free Download: Top 200+ Instagram Hashtags for 2017"
Grab my swipe file with over 200 top Instagram hashtags. Simply copy and paste my list. It’s yours for free. Take a look at other established brands (or even personal users and bloggers) in your travel niche for examples of good industry hashtags. A travel writer focusing on family, for example, would want to use very different hashtags from those used by a solo traveler. Take some time to follow other successful Instagram users in your niche, to get a feel for what works and what doesn't. On Instagram, it's not just the hashtags you use that matters, but also how many. Instagram allows a maximum of 30 hashtags in a post or comment. Aim to keep your hashtags relevant, interesting and specific. It's also important to note that hashtags can include letters and numbers, but they can't contain any non-numerical symbols (so #herbandwood might work as a hashtag, but #Herb&Wood does not). Searching hashtags on Instagram is also a good way to find new users to follow and get your account noticed. For example, if you use a certain hashtag on your posts, or if there's a certain hashtag that is relevant to your brand, you can do a search for it and see all of the photos posted with that hashtag. Scroll through and like the ones you find interesting, and follow users with content you like. If those users think your content is relevant to their interests, they'll likely follow back — or at least check out (and maybe interact with) your posts. Experiment with different hashtag combinations and see which work the best. As long as your hashtags are relevant to the photo you’re posting and your target audience, they should be fine. Don’t overdo it with your hashtags in your first comment. Try sticking with 3 to 5 hashtags in the original post. Then, in the first comment, add the additional tags that total up to 30. If your travel blog is also a business and you sell e-books or other products and you offer discounts or specials, you can offer exclusive discounts on your Instagram account. All you need to do is create a graphic that shows the discount percentage and discount code (you can easily do this using Canva), then explain how to use the code in your caption. But you don’t have to be an eCommerce store owner to use this tip. Get creative, and figure out a way to offer exclusive discount for the products and/or services via affiliate marketing. Don’t underestimate the power of your copy when you’re writing captions for your Instagram posts. Those captions can be the difference between 1 like and 1,000 likes, so take your time while writing and make sure whatever you put there is good. Also, keep in mind that Instagram captions can help you build your brand. If your brand is edgy, write something edgy. If your brand is positive and uplifting, write something positive and uplifting. Whatever you decide to write for your captions, tailor the messaging based on your brand and target audience, and you’ll see better overall results from your Instagram marketing efforts. In Conclusion Just like anything else, the results you get from your small business Instagram account will depend on how much effort you put into it. Follow the tips outlined here consistently, and you can feel confident knowing that you’ll soon see your following begin to grow. Keep it up, and who knows – Instagram marketing might just become one of your most powerful methods of connecting with new customers! Which of these tips will you use to start improving your Instagram marketing efforts? Photo Ads: These look like regular photo posts, but they have a Sponsored label above the photo. They also have a Learn More button on the bottom right corner, under the photo. Video Ads: Like the photo ads, these look like regular video posts, but with a Sponsored label on top. Carousel Ads: These ads look identical to photo ads, but feature multiple photos that users can swipe through. All three ad formats appear in users' home feeds while they scroll through the app. These ads support four different objectives: video views, clicks through to your website, mobile-app installs and raising mass awareness. For more information on advertising on Instagram, go here. I am an entrepreneur at heart. I have run the award-winning travel blog, 52 Perfect Days for eight years. I started blogging before social media became an important component of blogging. I learned my around social media quickly because of my blog and worked as the social media manager for my husbands agency, ZD Design for five years. When I'm not blogging or knee deep working on social media strategy you'll find me exploring the world with my 14 year old son. Welcome to the Break Into Travel Writing "Instagram Portal". 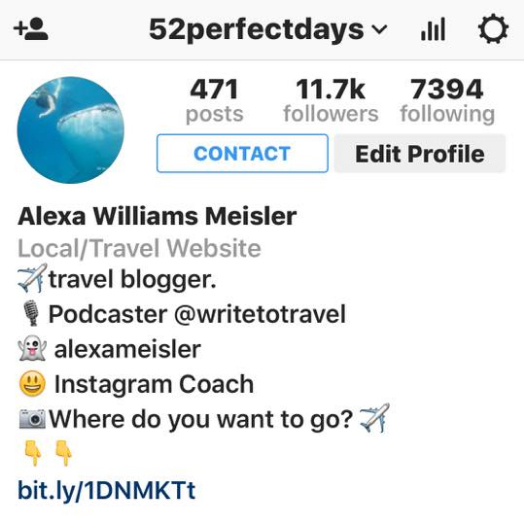 My name is Alexa and I have created a bunch of content to help travel writers and travel bloggers with Instagram. 18 INSTAGRAM TIPS CHECKLIST FOR TRAVEL BLOGGERS AND TRAVEL WRITERS.